Congratulations to our members (and spouses) who scored the third place finish at the trivia event on Saturday, November 6th! Posted by levetzow in Service Projects. We have three potential service projects for October. Read the descriptions and vote for any or all that you would like to help out with. For the past couple of years, we’ve supplied reading materials for the children who use the services offered by the WIC offices. We can supply them with a much larger number of items if we buy used, instead of new. We need Kiwanians who are willing to weed through the huge amount of books at the Book Fair to find new and nearly new for children birth to 5. Volunteers are needed to help with Scarecrow Shenanigans on October 24, 2010. Volunteers are a large part of this special event, and even get to dress in costume! Volunteer responsibilities include assisting with refreshments, Halloween games and activities, set-up and tear-down. Volunteer shifts are from 11:30 a.m. – 3:00 p.m. or 2:30 – 5:30 p.m. Volunteers may help at one or both shifts. Terry Timmerman from Habitat for Humanity is the presenter for our September 21 meeting. He’ll tell us what Habitat for Humanity is doing in our community, and how we can help. We could arrange a date for us to work on a Habitat house as a group. Now vote! You can select any or all! This Saturday, July 17, is the rescheduled day for our Movie in the Park. More volunteers are needed. Please be at the Veteran’s Memorial Park between 8:00-8:15pm to hand out the flags. You do not need to stay for the movie. Thanks to all of the club’s members who volunteered to help marshal the Bettendorf parade on Sunday! Have a safe Independence Day! The Bettendorf Kiwanis Club completed a service project at Kiwanis Park in Bettendorf. 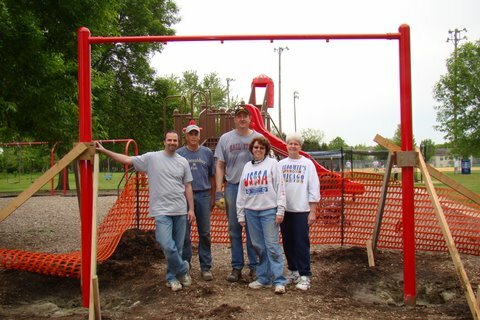 The project was the installation of a new tot swing in the playground area. The members that volunteered that day are pictured from left to right; Mike Spector, Gary Kamp, Steve Grimes, Maria Levetzow, and Cyndy Behrer (not pictured is Bill Bicknese). 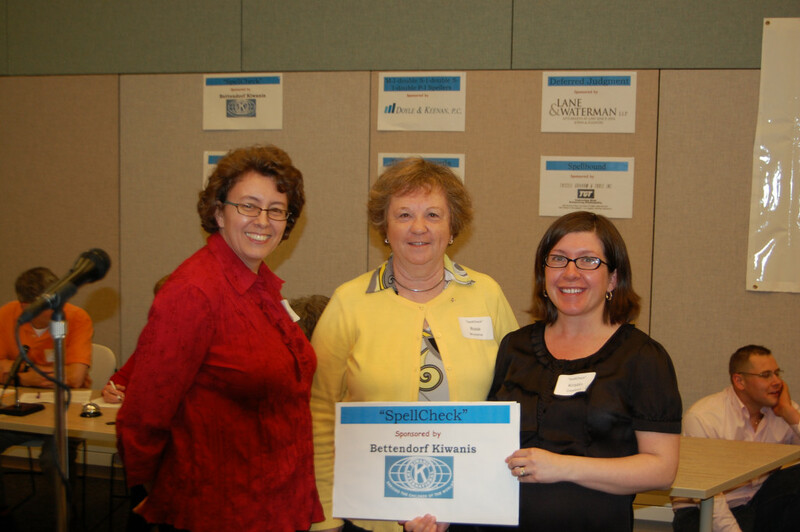 The Bettendorf Kiwanis Club has been supporting project for the children of our community for over 35 years. The club is made up of 38 volunteer members, and meets on every Tuesday at 12 noon for a luncheon meeting, at the Lodge, in Bettendorf. Maria, Rosa and Kristin represented the club at the 2nd annual QC Spells Spelling Bee held at the Bettendorf Public Library on April 28th, 2010. Our club sponsored its members with a $350 contribution to the cause. The skip-a-meal service project on April 13th at Cafe on Vine was a huge success! Thanks for serving meals and donating your time and money to the cause!